Handmade in Africa with the unparalleled care and attention of a team of grandmothers, Thusk™ knitwear is the safari and winter wool collection with a heart-warming story. Made from sustainably-sourced South African wool, Thusk™ is the natural choice to stay snug when the weather gets chilly. 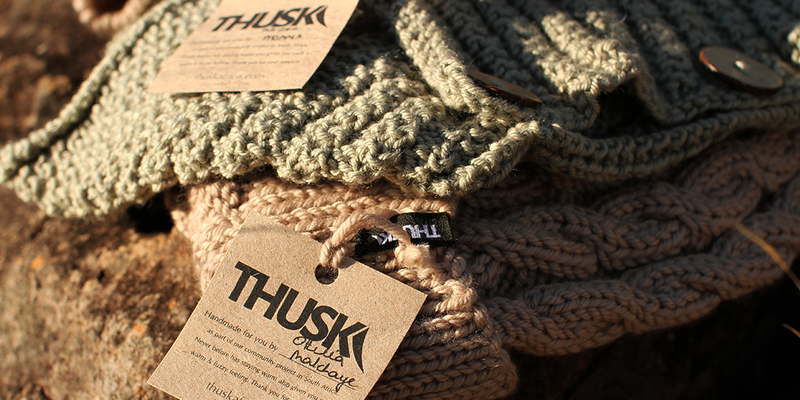 Why should you take Thusk™ knitwear on safari? When people think of Africa, it is often framed in golden sunshine, but don’t be fooled - it gets cold on safari and that’s why we recommend a warm layer as a safari essential. On the back of open game-viewers, early morning starts and late evenings outside at the lodge, your Thusk™ safari knitwear will prove itself useful and enhance your enjoyment of the outdoors. There’s something special about your grandmother’s knitting and this is what The Safari Store founder Steve had in mind when he approached his mother with the idea for Thusk™ - The Hazel Underground Secret Knitwork. Since then, the Thusk™ team’s knitting needles have been clicking to produce a range of premium individually-made knitted items in safari-friendly colours for your safari and winter adventures. Made in Africa for Africa, these beautifully-crafted scarves, beanies, and headbands have been expedition-tested™ in Africa and the French Alps and style-tested during a Parisian winter as part of our quality promise to you. Thusk™ Cable-Knit Beanie When it comes to keeping warm, your winter wardrobe is incomplete without a great beanie. In a classic cable-knit, fold-over design, this is the perfect way to protect your head and ears from the freezing air on game drives and dewy early walks. 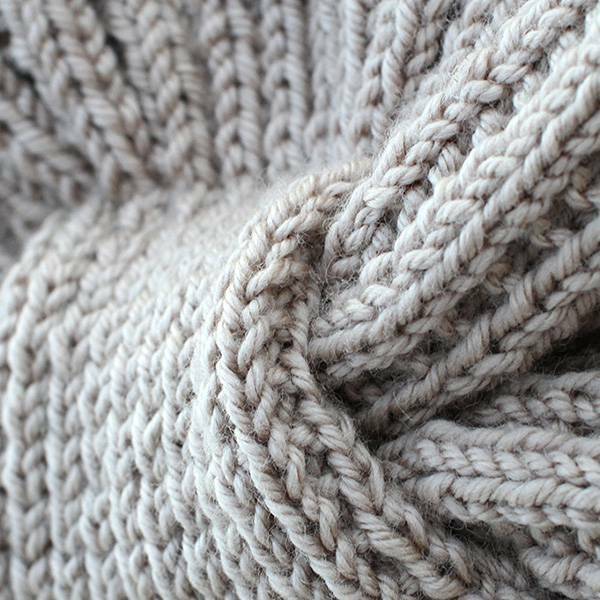 Made from 100% sustainable South African wool, enjoy the timelessly trusted benefits of this soft, natural material. 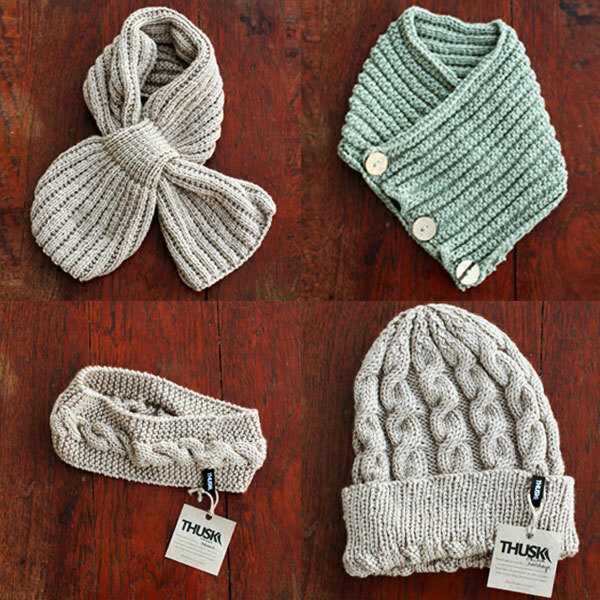 Thusk™ Knitted Button Scarf Adventure elegance is easy with this fresh scarf. Made from a South African 75% wool blend with coconut husk buttons, this stylish ribbed scarf buttons in the warmth by creating a cuff around the neck. This not only traps heat; it accentuates the neckline of your fleece, gilet, or shirt for a bit of elevated safari style in every setting. Thusk™ Knitted Bow Scarf A different take on the traditional scarf design, this bow scarf has a thread-through design, which offers versatility around how you tie it. Threaded through, this ribbed scarf has a smooth bow effect that looks great around the necks of men and women. Made from 100% South African wool, sustainably sourced from a select group of farmers. Thusk™ Knitted Headband The understated fashion accessory for every woman, the Knitted Headband has a classic cable-knit design for a bit of contemporary safari style. Keep your ears warm and your hair in place on the back of draughty game drive vehicles or urban blizzards. Made from 100% breathable, hypo-allergenic natural South African wool. 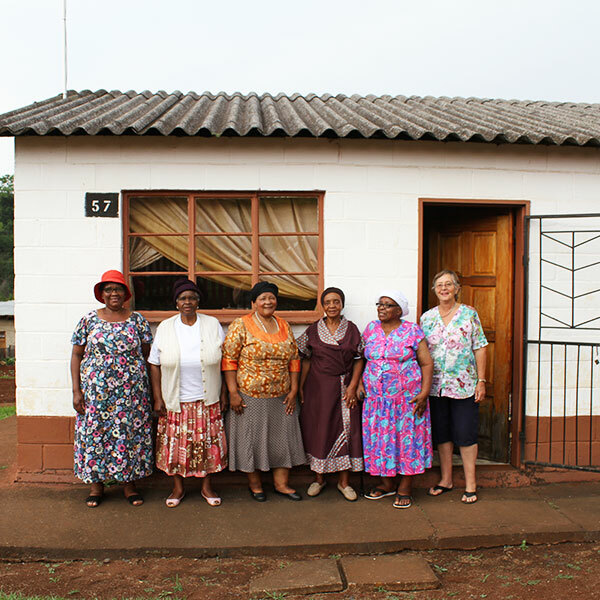 Together with Steve’s mom, Hazel, the Thusk™ knitters comprise a small group of Zulu grandmothers based in the rural KwaZulu-Natal Midlands in South Africa. The income they derive from the Thusk™ project supplements their government pensions - something which assists greatly in their daily survival and their roles as family caregivers. In the age of mechanisation and mass production, there is something incredibly special about the skill and individual attention that goes into artisanal, handmade goods. Every woman knits at her own pace around her daily responsibilities, working to exacting standards to create goods of exceptional quality. They are united by a common love of the craft and enjoy the social element of the group. Each Thusk™ garment indicates the name of the knitter on the tag, giving you a connection to Africa in a small but meaningful way. Ottilia Makhaye worked for years as a domestic worker for a woman who taught her to knit to a very high standard. She lives with some of the family and keeps house for them. She is the natural leader of their church group and is respected in the community as a resourceful, wise person. Florence Gumede is a gentle, dignified woman who lives nearby. She is charming and has a quiet sense of humour too. Ethel Dlamini is a 60-plus year old mother and grandmother who worked in a domestic and carer position for her working life. She is now “the granny” at home who also cares for her elderly mother who lives nearby. It is through Ethel that I met her group of friends. Norah Madondo is a church friend of Ethel’s and has recently joined the group in our second season of knitting. Grace Mtshali has her challenges with her health and her eyesight but enjoys knitting when she is able to and is a regular member of the group. In coming up with the Thusk™ concept, The Safari Store's founder, Steve, approached the best knitter he knew to head the project: his mother, Hazel Adams. In wanting to provide knitwear you can wear anywhere, we needed to be sure it could work in very cold conditions. Alpine-tested on French ski slopes and style-tested in the fashion capital of the world during a Parisian winter, these knits have kept us snug in snow, drizzle, and below-freezing adventures. Alpine-tested by Steve in Valloire, Thusk™ knits proved themselves to be warm and breathable for full days of snowboarding. The woolen wardrobe accents you need for snow days, Thusk™ garments are a must-have winter accessory. Style-tested during winter in Paris, Thusk™ knits are a winter classic for the urban adventurer. From cafe culture to white-outs, we put Thusk™ to the test. The verdict? We won't leave home without our favourite knits when the weather turns cold. 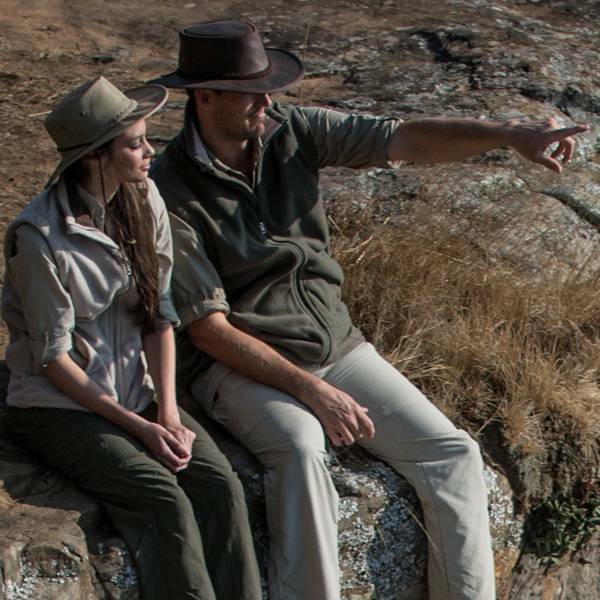 Safari Clothing Packing Advice: What clothing to pack for your safari.